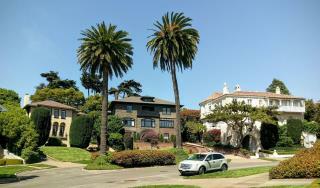 (Newser) – A real estate-savvy couple is now the proud owner of the streets and sidewalks of uber-wealthy, uber-exclusive San Francisco gated community Presidio Terrace. But residents of the 35 mega-mansions lining the private, oval-shaped street are pushing back, reports the San Francisco Chronicle. South Bay couple Tina Lam and Michael Cheng scooped up the street at a city-run auction for a little over $90,000 in 2015. The street was up for grabs due to unpaid property taxes that the community’s homeowner’s association neglected to pay for 30 years. Seeking to recover the $14 owed per year, the city put the street up for sale. (Plus interest and penalties, the bill amounted to a whopping $994.) Residents say they didn’t know about the back taxes or sale until this May, when a title search company hired by Cheng and Lam sent out letters asking if property owners were interested in buying the street back. Simple capitalism at work, have no objections. “I really just wanted to own something in San Francisco because of my affinity for the city.” What a load of $hit. I call BS. I've read the news articles about this and apparently San Fran has 181 private streets where these annual fees are charged. It's probably not accurate to call them property tax though. And it still doesn't sound reasonable that they would fail to contact the HOA because they had an address from the 1980's . Get real. Something more than meets the eye is definitely going on here. And who keeps the $89k in profit since less than $1000 was owed? Is the city looking to make huge profits like this? I don't think so. They likely just wanted the unpaid money. The statement about the title company doesn't ring true either. So many things sound fishy here. I'm not faulting newser. This has been reported in many places. But it still doesn't sound like we are getting the whole story. The taxes were only $994 after 30 years and yet the auction went to $90k? I will bet we will hear more about this story. It's too convenient that we get a "rich snobs get their commeuppance" story like this. People shouldn't be so quick to uncritically believe this stuff. If you put the word Obama or Hillary in it then every right-winger would analyze it under a microscope and find 50 things wrong with it instantly.